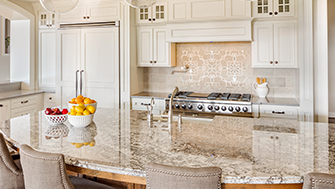 Graniteworks, a Kenny's division, imports, fabricates and installs luxury granite in the Kansas City area as well as natural marble and travertine from destinations such as India, Brazil, Italy and Spain. We offer a wide selection of over 60 in-stock colors ranging from the most common and popular to the most unusual exotics. 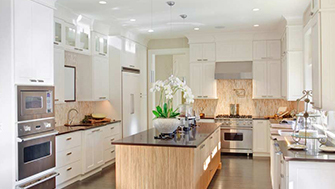 We encourage each homeowner to visit our facility and personally select their slabs. Come visit our new Graniteworks showroom which features full kitchen and bathroom displays with Traditional, Rustic & Modern design variations. 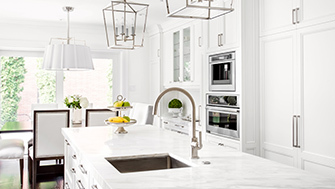 For your other home remodeling or kitchen remodel needs, Kenny’s also stocks a wide variety of Stainless Steel, Silgranite, Copper & Glass sinks from the top manufacturers in the industry. 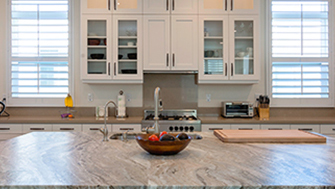 When you are doing a kitchen upgrade such as new granite countertops, hardwood floors, stainless steel sinks and a tile backsplash, there really is no better place to get everything you need. We have it all. All at one campus. Graniteworks employees are specifically trained and experienced in their field to perform every template, fabrication and installation. Our quality craftsmanship and service after the sale sets Graniteworks apart from all others. Have an estimator come out tomorrow and give you a quote on your kitchen remodel or basement finish job.